What is it? A minimalist management game with lots of secrets. Kingdom is easy at first. My job is to assign peasants tasks as they stave off waves of monsters, and it’s like working on a slow-moving assembly line. But then the conveyor belt starts speeding up. And then I stop recognizing the machinery coming down the line. Imps attack in numbers greater than my army of archers can handle, phantasms appear and fly over my highest walls to chow on my builders—suddenly, I’m Lucille Ball shoving candy in my mouth. Kingdom’s merciless shift from zen to ten instilled a real sense of dread in me, even during the gentle slope of the early game. It was a nice, calm game at first, but then it robbed me of my peace of mind and made me struggle to reclaim it. With every new game of Kingdom, you spawn as a king or queen sporting some randomly colored garb atop a horse and canter along a forested 2D plane until you stumble upon a few loose coins. They can be spent on recruiting new villagers, tools, building fortifications, or on mysterious monoliths hidden in the forest. The first required purchase is a campfire. Throw a coin into the empty coin space hovering above it and—fanfare—you’ve kicked off your kingdom. Kingdom prompts you to give some wandering peasants a coin, then to drop a few more into bows and hammers. Your new followers will pick up whatever tool is nearest to them, provided they’re not already equipped. And so you have your first defenses and your first builder. And that’s where Kingdom stops explaining anything. Mystery and subtlety are central to Kingdom. Nothing is overtly communicated. Close scrutiny of otherwise simple aspects of the game (animation, musical cues, lighting) is vital in order to achieve the highest build efficiency. For example, I found that if I had tools ready for new villagers back at my hold, when I recruited them at their camps deep in the forest, they would scurry just a little bit faster than normal to join me. With a quick day-night cycle, it’s critical that they get back before they’re accosted by a monster, robbed of their coin, and sent back to a meaningless pre-currency life. Or, if I let my horse chomp on some green grass—which I just thought was an idle animation—I could actually sprint for longer before fatigue settled in and forced us to a crawl. Time it correctly and I could get more exploration, coin collection, and peasants commanded than before. But the motivation to pay attention didn’t come without failure, and I failed a lot. Monsters can attack from any side every night, and if they decimate your camp of supplies and coin, they’ll go for your crown next which means it’s time to start over. In my first hour or so, I didn’t mind. Failure was often the result of missing an obvious cue, mechanic, or because I just made a dumb mistake. The curve was fair and rewarded me for paying attention. But once I got a few hours of experience in and figured out how to build more efficiently, a single game could last upwards of 45 minutes. Lessons start to come in smaller doses or not at all. There’s too much important mechanical depth hidden in Kingdom’s presentation to send the player back half an hour without teaching them something. Failing these long games tested me. At my worst, I yelled at my monitor, slammed the table, and spilled my tea. I really wanted that tea. Even after grinding through the late game learning curve to discover a few new nuggets of wisdom, I was still performing rote tasks to get there. A one-life game like Spelunky exercises and rewards advanced play in the early game by letting the player subvert massive chunks of it with feats of well-earned skill. Kingdom’s early game is nearly the same every playthrough regardless of player skill. I’d rather practice blocking karate chops than licking and sealing envelopes. There’s no persistence between games, even though the initial 10 minutes or so of recruiting villagers and building a basic walls really isn’t something that’s fun to repeat. I’d rather practice blocking karate chops than licking and sealing envelopes. Luckily, the music went a long way in keeping me sane. A soft chiptune soundtrack rings in each morning with pleasant harmonics and pulls my patience out of the mud with a gentle tug or two. It’s truly beautiful, serving as a lovely backdrop to a nice gallop through the forest. Parallax foreground and background scenery give a sense of depth and lush sprites with faint animations indicate life. Even your monarch’s crown hops up and down mid trot. It’s a super curious, atmospheric game despite its minimalism, which is why it’s so painful to find the game such a frustrating grind. Kingdom is home to a beautiful, mysterious world I desperately want to explore. There were thrilling moments where a massive army of monsters were throwing themselves against my last defenses and I barely managed to make it to morning—it just takes too long between failures to reach the point where I find opportunity to grow. The moment to moment gameplay is pleasurable in the same way that dragging a rake through a zen garden can be, except the Zen Garden Inspector rolls around later on, kicks dust into your eyes, and tells you to start over without explaining why. 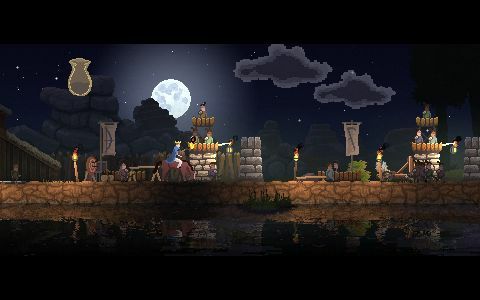 There’s tons of fun to be had in Kingdom, but the fun ends where your patience does. The forest is thick enough to blot out the sun. It's easy to lose track of time. Hey! That's the name of the game! Villagers hang out at camps in the forest. Toss 'em a coin, and they're yours. Whenever the moon is high, so is my anxiety. The sky always looks lovely. I mean, seriously. Gotta 'gram it. Upgrading the keep can be pretty helpful, but pumping too much coin into it too soon—well, don't rush in. What do the arrows mean? Spend six coins to find out! This can't be a good thing. It's definitely not a good thing.